2013-01-24 Application filed by CardioSonic Ltd. filed Critical CardioSonic Ltd.
A method of selectively reducing renal norepinephrine levels in an animal or human, said method comprising selecting a norepinephrine target level and applying energy to one or more renal nerves in an amount which is sufficient to reduce renal norepinephrine levels to said selected target level within about +/- 30%. Devices for selectively reducing renal norepinephrine levels are also described. Provisional Patent Application No. 61/590,423, filed 25 January 2012, the disclosure of which is incorporated herein by reference. This application is related to co-pending and co-assigned PCT Patent Application No. PCT/IB2011/054640 filed October 18, 2011, entitled "TISSUE TREATMENT", which teaches applying energy to lower renal nerves. The present invention, in some embodiments thereof, relates to a method of treating nerves and, more particularly, but not exclusively, to a method of selectively lowering renal norepinephrine levels. In an exemplary embodiment of the invention, the nerve is in a mammal, for example, a pig or a human. Hypertension" N ENGL J MED 361;9, August 27, 2009, disclose "Figure 1. Norepinephrine Renal and Whole-Body Spillover and Results of Microneurography before and after Renal-Nerve Ablation." Atherton DS et al., "Micro-anatomy of the renal sympathetic nervous system: A human postmortem histologic study", Clin Anat. 2011 Oct 4. doi: 10.1002/ca.21280. [Epub ahead of print], disclose "a great proportion of renal sympathetic nerves have close proximity to the lumen-intima interface..."
SHR during the development of hypertension." 2:349-359, 1984 disclose "intrarenal adenosine produces hypertension by activating the sympathetic nervous system". US Patent Application 2011/0208175 by Sobotka et al. disclose "Methods for therapeutic renal neuromodulation". Krum H et al. "Catheter-based renal sympathetic denervation for resistant hypertension: a multicentre safety and proof-of-principle cohort study", Lancet 2009; 373: 1275-81, disclose "Catheter-based renal denervation causes substantial and sustained blood-pressure reduction, without serious adverse events, in patients with resistant hypertension." Xu D and Pollock M. "Experimental nerve thermal injury", Brain (1994), 117, 375-384, disclose "Thermal injury to rat sciatic nerve was produced by local heating (47 and 58°C) and studied physiologically and morphologically. Unmyelinated nerve fibres showed a greater direct vulnerability to hyperthermia; first manifest as a reversible conduction block of C fibre action potentials..."
Witkowski et al. "Effects of Renal Sympathetic Denervation on Blood Pressure, Sleep Apnea Course, and Glycemic Control in Patients With Resistant Hypertension and Sleep Apnea", Hypertension. 2011;58:00-00, disclose "... catheter-based renal sympathetic denervation lowered BP in patients with refractory hypertension and obstructive sleep apnea, which was accompanied by improvement of sleep apnea severity. Interestingly, there are also accompanying improvements in glucose tolerance." Mogil et al. "Renal innervation and rennin activity in salt metabolism and hypertension", Am J Physiol. Vol. 216, No. 4, 1969, disclose "Serial measurements of renal cortical norepinephrine (RCN) were made to provide quantitative information concerning the state of renal innervation before and after renal sympathectomy." Kline et al. "Functional reinnervation and development of supersensitivity to NE after renal denervation in rats", Am J Physiol. 1980 May;238(5):R353-8 disclose "The time course for functional reinnervation and development of supersensitivity to norepinephrine (NE) in the denervated rat kidney was studied..."
DiBona GF "Renal innervation and denervation: lessons from renal transplantation reconsidered." Artif Organs. 1987 Dec;l l(6):457-62. disclose "the time course of renal neural degeneration and reinnervation". Hansen JM et al. "The transplanted human kidney does not achieve functional reinnervation." Clin Sci (Lond). 1994 Jul;87(l): 13-20. disclose "the human transplanted kidney remains functionally denervated". Liu P and Rappaport CM "A Helical Microwave Antenna for Welding Plaque During Balloon Angioplasty", IEEE TRANSACTIONS ON MICROWAVE THEORY AND TECHNIQUES, VOL. 44, NO. 10, OCTOBER 1996. disclose "...a catheter-based microwave helix antenna..."
W Microwave Near-Field Probe", IEEE TRANSACTIONS ON MICROWAVE THEORY AND TECHNIQUES, VOL. 52, NO. 8, AUGUST 2004 disclose "a medium power microwave near-field probe..."
Copty A et al. "Low power near-field microwave applicator for localized heating of soft matter", Applied Physics Letters, Volume 84, Number 25, 2004, disclose "... a 9 GHz near-field microwave probe..."
Rappaport C "Treating Cardiac Disease with Catheter-Based Tissue Heating", IEEE Microwave Magazine, March 2002. Brasselet C et al. "Effect of local heating on restenosis and in-stent neointimal hyperplasia in the atherosclerotic rabbit model: a dose-ranging study" European Heart Journal (2008) 29, 402-412, disclose "Moderate heating represents a promising approach to prevent in-stent restenosis via the limitation of the proliferative response without thrombosis induction." Glazier JJ et al. "Laser balloon angioplasty combined with local intracoronary heparin therapy: Immediate and short-term follow-up results" Am Heart J 1997;134:266-73. Wolf de Jonge ICDYM et al. "25 Years of Laser Assisted Vascular Anastomosis (LAVA): What Have We Learned?" Eur J Vase Endovasc Surg 27, 466-476 (2004). Disclose "Advantages of LAVA are minimal vessel damage, faster operation and the potential for minimally invasive application." Aoyama H. et al. "Comparison of Cryothermia and Radiofrequency Current in Safety and Efficacy of Catheter Ablation within the Canine Coronary Sinus Close to the Left Circumflex Coronary Artery" J Cardiovasc Electrophysiol. 2005 Nov;16(l l): 1218- 26. disclose "Cryoablation in CS within 2 mm of LCx produces Trans-CSM lesions similar to RFA..."
Fujikura K. et al., "Effects of Ultrasonic Exposure Parameters on Myocardial Lesions Induced by High-Intensity Focused Ultrasound" J Ultrasound Med 2006; 25: 1375-1386. disclose "High-intensity focused ultrasound creates well-demarcated lesions in ex vivo cardiac muscle without damaging intervening or distal tissue..."
Diederich CJ and Hynynen K "Ultrasound Technology for Hyperthermia", Ultrasound in Med. & Biol., Vol. 25, No. 6, pp. 871-887, 1999. disclose "... a general review of a selection of ultrasound hyperthermia systems..."
Ohkubo M et al. "Histological findings after angioplasty using conventional balloon, radiofrequency thermal balloon, and stent for experimental aortic coarctation", Pediatrics International (2004) 46, 39-47. disclose "... RFTB or stent can provide relatively small injuries in the vessel wall..."
Katholi, RE. Renal nerves in the pathogenesis of hypertension in experimental animals and humans. Am. J. Physiol. 245 (Renal Fluid Electrolyte Physiol. 14): FI-F14, 1983. Rousselle S. "Experimental Pathways for the Evaluation of Extrinsic Renal Nerve Distribution, Density, and Quantification (Swine Model)", presented at the TCT conference on 2011. DiBona GF "Neural control of renal function: cardiovascular implications", Hypertension 1989, 13:539-548. Esler M "The 2009 Carl Ludwig Lecture: pathophysiology of the human sympathetic nervous system in cardiovascular diseases: the transition from mechanisms to medical management" J Appl Physiol 108: 227-237, 2010. DiBona GF and Esler M, "Translational medicine: the antihypertensive effect of renal denervation" Am J Physiol Regul Integr Comp Physiol 298: R245-R253, 2010. Wilcox JN, "Resistant Hypertension and the Role of the Sympathetic Nervous System", presented at the Innovations in Cardiovascular Interventions (ICI) conference, Tel Aviv, Israel, 2011. Granada JF and Rousselle S. "A Translational Overview for the Evaluation of Peri-Renal Denervation Technologies", presented at the Innovations in Cardiovascular Interventions (ICI) conference, Tel Aviv, Israel, 2011. Failure, Insulin Resistance and Sleep Apnea", presented at the Innovations in Cardiovascular Interventions (ICI) conference, Tel Aviv, Israel, 2011. Papademetriou V et al., "Renal Sympathetic Denervation for the Treatment of Difficult-to-Control or Resistant Hypertension", International Journal of Hypertension Volume 2011, Article ID 196518, 8 pages. Markis A et al., "Resistant Hypertension Workup and Approach to Treatment", International Journal of Hypertension, Volume 2011, Article ID 598694, 10 pages. Campese VM et al., "Sympathetic Renal Innervation and Resistant Hypertension", International Journal of Hypertension, Volume 2011, Article ID 814354, 6 pages. Martin EA and Victor RG, "Premise, Promise, and Potential Limitations of Invasive Devices to Treat Hypertension", Curr Cardiol Rep (2011) 13:86-92. Mahfoud F et al., "Is there a role for renal sympathetic denervation in the future treatment of resistant hypertension? ", Future Cardiol. (2011) 7(5), 591-594. DiBona GF "Neural Control of the Kidney: Past, Present, and Future", Hypertension 2003, 41:621-624. Blankestijn PJ and Ritz E, "Renal denervation: potential impact on hypertension in kidney disease? ", Nephrol Dial Transplant (2011) 26: 2732-2734. DiBona GF, "Physiology in perspective: The Wisdom of the Body. Neural control of the kidney" Am J Physiol Regul Integr Comp Physiol 289: R633-R641, 2005. Campese VM, "Renal afferent denervation prevents the progression of renal disease in the renal ablation model of chronic renal failure in the rat. ", Am J Kidney Dis. 1995 Nov;26(5):861-5.
applying energy to one or more renal nerves in an amount which is sufficient to reduce renal norepinephrine levels to the selected target level within about +/- 30%. In an exemplary embodiment of the invention, the predetermined target level comprises less than about 50% of a pre-treatment level or control baseline. Alternatively, the predetermined target level comprises less than about 70% of a pre-treatment level or control baseline. Alternatively, the predetermined target level comprises less than about 80% of a pre-treatment level or control baseline. Alternatively, the predetermined target level comprises less than about 90% of a pre-treatment level or control baseline. In an exemplary embodiment of the invention, the predetermined target level comprises a predetermined target level at a predetermined time post-recovery. Optionally, the predetermined time post-recover comprises about 30 days. Alternatively, the predetermined time post-recovery comprises about 90 days. In an exemplary embodiment of the invention, the energy comprises microwave energy. Alternatively the energy comprises a broad ultrasound beam ultrasound. In an exemplary embodiment of the invention, the applying comprises applying the broad ultrasound at a frequency ranging from about 1 MHz to about 40 MHz. In an exemplary embodiment of the invention, the applying comprises applying the broad ultrasound for a time of about 10 seconds to about 30 seconds. In an exemplary embodiment of the invention, the applying comprises applying the broad ultrasound at an intensity of about 10 watt/cm 2 to about 60 watt/cm 2. In an exemplary embodiment of the invention, the energy is applied intracorporeally from at least one of a renal artery and an aorta. In an exemplary embodiment of the invention, the applying comprises applying the energy in an amount which is insufficient to cause clinically significant damage to an intima and a media layer of a renal artery. In an exemplary embodiment of the invention, the applying comprises applying the energy in a manner which is not sufficient to cause significant thermal visible damage on histological examination to the renal nerves at 30 or more days post treatment. Optionally, the histologically visible damage comprises histologically visible damage with at least one of an H&E stain and a Movat stain. In an exemplary embodiment of the invention, the renal norepinephrine levels are measured by at least one of analysis of a kidney biopsy and norepinephrine spillover. applying broad ultrasound energy to one or more tissue regions in an amount which is sufficient to reduce activity of one or more renal nerves such that a clinically significant effect is obtained, thereby treating the patient. In an exemplary embodiment of the invention, the energy comprises intracorporeal non-focused ultrasound. In an exemplary embodiment of the invention, the applying comprises applying the energy in an amount which is insufficient to cause clinically significant narrowing of a renal artery. In an exemplary embodiment of the invention, the applying comprises applying the energy in a manner which is not sufficient to cause significant histologically visible damage to the renal nerves at 30 or more days post treatment. Optionally, the histologically visible damage comprises histologically visible damage with at least one of an H&E stain and a Movat stain. In an exemplary embodiment of the invention, a reduction of some of activity of efferent sympathetic renal nerves is temporary. In an exemplary embodiment of the invention, some of comprises at least 50% of the efferent nerves. In an exemplary embodiment of the invention, temporary comprises a return to at least 50% of a baseline activity. Optionally or additionally, temporary comprises less than about 120 days. In an exemplary embodiment of the invention, the clinical disorder comprises at least one of hypertension, sleep apnea, obesity, diabetes, end stage renal disease, heart arrhythmia and/or congestive heart failure. In an exemplary embodiment of the invention, applying comprises applying energy to one or more tissue regions around a circumference of a renal artery. In an exemplary embodiment of the invention, applying comprises applying energy to one or more tissue regions not surrounding an artery. In an exemplary embodiment of the invention, applying comprises applying energy to one or more longitudinal locations along a renal artery. In an exemplary embodiment of the invention, applying comprises applying energy to about 0.1% - 5% of the artery wall by cross sectional area. In an exemplary embodiment of the invention, applying comprises applying energy to one or more regions having an area of about 1 mm 2 - 20 mm 2 per the region. In an exemplary embodiment of the invention, applying comprises applying energy to both renal arteries. Optionally, applying comprises applying energy to an arterial stump. In an exemplary embodiment of the invention, applying comprises applying energy to at least one of an adventitia and a periarterial region of a renal artery. selecting a frequency of the non-focused ultrasound energy; selecting an intensity of the non-focused ultrasound energy; selecting a time of delivery of the non-focused ultrasound energy; and setting up the device to be suitable for delivering a predetermined amount of the non-focused ultrasound energy to one or more renal nerves according to the frequency, the intensity and the time. In an exemplary embodiment of the invention, the frequency of the non-focused ultrasound ranges from about 10 MHz to about 20 MHz. In an exemplary embodiment of the invention, the time comprises about 10 seconds to about 30 seconds. In an exemplary embodiment of the invention, the intensity comprises about 20 to about 30 watt/cmA2. There is provided in accordance with an exemplary embodiment of the invention a method of selectively temporarily reducing renal norepinephrine levels in an animal or human, the method comprising: applying energy to one or more renal nerves in an amount which is sufficient to temporarily reduce renal norepinephrine levels to a predetermined target level, wherein the temporarily comprises a return to a baseline of at least 50% of a baseline. In an exemplary embodiment of the invention, temporarily comprises less than 120 days. applying energy to one or more nerves in an amount which is sufficient to selectively reduce nerve function, but the amount is not sufficient to cause significant chronic thermal visible damage on histological examination damage to the nerves. In an exemplary embodiment of the invention, the histologically visible damage comprises histologically visible damage with at least one of an H&E stain and a Movat stain. In an exemplary embodiment of the invention, the nerves are unmyelinated nerves. Optionally, the nerves have an axonal diameter of less than about 500 micrometers. comparing the measured blood pressure to a baseline blood pressure rise; and verifying a selected reduction in the afferent renal nerve function according to the comparing. In an exemplary embodiment of the invention, verifying is performed during the procedure to measure the effect. In an exemplary embodiment of the invention, the drug comprises at least one of adenosine and bradykinin. In an exemplary embodiment of the invention, the baseline blood pressure rise comprises a baseline blood pressure rise due to delivery of the drug to the kidney before treatment. In an exemplary embodiment of the invention, the method further comprises repeating a treatment according to the verifying, to further reduce the function to a selected level. Optionally, the repeating comprises repeating during the same procedure. wherein the controller is configured to deliver enough power to heat the target tissue a desired thermal effect to reduce nerve function to a preselected level. an energy emitted with settings suitable to obtain a desired thermal effect to reduce nerve function to a preselected level. In an exemplary embodiment of the invention, the apparatus further comprises an interface adapted to obtain at least one of a treatment time and a treatment intensity from a user, the interface coupled to the energy emitter. a memory comprising predetermined settings to obtain a desired reduction in renal nerve function. In an exemplary embodiment of the invention, the catheter is marked with the desired reduction. In an exemplary embodiment of the invention, the catheter is adapted to couple to a controller, and the catheter is adapted to program the controller with the predetermined settings. selecting parameters known to not cause stenosis of a renal artery and to cause nerve modulation of renal nerves that has a lasting effect. In an exemplary embodiment of the invention, the lasting effect comprises over 1 day. Alternatively, the lasting effect comprises over 1 month. Some embodiments of the invention are herein described, by way of example only, with reference to the accompanying drawings and/or images. With specific reference now to the drawings in detail, it is stressed that the particulars shown are by way of example and for purposes of illustrative discussion of embodiments of the invention. In this regard, the description taken with the drawings makes apparent to those skilled in the art how embodiments of the invention may be practiced. FIG. 10 is a flowchart of a method of checking the selective reduction in afferent nerve function, in accordance with an exemplary embodiment of the invention. An aspect of some embodiments of the invention relates to a method for selectively reducing activity and/or function of nerves. Optionally, the nerves are renal nerves. Optionally or alternatively, the nerves are substantially unmyelinated. In an exemplary embodiment of the invention, a relative proportion of renal nerves are affected, for example, 10%-100% of the nerves, or 25%-75%, about 20%, about 30%, about 50%, about 70%, or other intermediate values.. In an exemplary embodiment of the invention, the activity levels and/or function of the efferent and/or afferent nerves are reduced. In an exemplary embodiment of the invention, nerves are treated by application of ultrasound. Optionally, the ultrasound causes a thermal effect to the nerves, for example, the nerves are heated. In an exemplary embodiment of the invention, the ultrasound is non-focused. Optionally, the non-focused ultrasound energy is delivered from within the renal artery, for example by a catheter. In some embodiments, the energy is delivered to an arterial stump, for example, having a length of less than about 4 cm, about 3cm, about 2cm, about 1 cm, or other smaller, intermediate or larger artery lengths. Alternatively, one or more other suitable energy delivery devices and/or methods can be used to selectively reduce nerve activity, optionally by heating the nerves. Non- limiting examples include; radiofrequency (RF), laser, focused ultrasound (e.g., HIFU), microwave, hot fluid (e.g., through a saline filled balloon). Energy application can be performed invasively (e.g., using a catheter) or non-invasively (e.g., from outside the body). In an exemplary embodiment of the invention, the selective reduction in nerve activity is performed without significant chronic histologically visible damage, for example, thermal damage that is determined to be clinically significant, for example, after 30 days, 60 days, 90 days, 120 days, or other smaller, intermediate or larger time frames. For example, damage is visible histologically if the tissue sample is treated using H&E or Movat's stain, and viewed under a light microscope by a trained pathologist. In an exemplary embodiment of the invention, the tissue is heated to prevent significant chronic long term damage, for example, thermal damage. In some embodiments, some damage is allowed to the affected region, for example, less than about 5% of the cross sectional surface area of the region, or less than about 10%, about 15%, about 20%, about 25%, about 30%, or other smaller, intermediate or larger values are used. For example, the damaged area is no more than about 0.5 mmA2, or about lmmA2, 2mm A2, 4mmA2, or other smaller, intermediate or larger values are used. In an exemplary embodiment of the invention, treatment is performed without significant damage to the intima, for example, without causing clinically apparent damage. Alternatively, there is no damage to the intima and to the media. Alternatively, there is no damage up to the intima, media and adventitia. In an exemplary embodiment of the invention, measurements of renal norepinephrine levels are used as a target of nerve function and/or activity, non-limiting examples of measurements include; direct measurements of renal norepinephrine content (e.g., by kidney biopsy), renal norepinephrine spillover (e.g., minimally invasive), or any other suitable method. In an exemplary embodiment of the invention, renal norepinephrine levels are selectively reduced (e.g., relative to a pre-treatment baseline) to a target level, for example, by about 25%, about 33%, about 50%, about 70%, about 80%, about 95%, or other smaller, intermediate or larger reductions are used. Optionally or additionally, the levels are reduced to a target range, for example, to about 10%-50%, about 30%-70%, about 20%-40%, or other smaller, intermediate or larger ranges are used. Alternatively, the levels are reduced to be below a target threshold, for example, below about 80%, below about 50%, below about 30%, below about 10%, or other smaller, intermediate or larger values are used. In an exemplary embodiment of the invention, the NE level is reduced by 100%. Alternatively, the NE level is reduced to be below 80%. In an exemplary embodiment of the invention, the plan is to reduce the NE levels to the target level described, for example, to 50% of baseline. In an exemplary embodiment of the invention, the accuracy of the reduction of the reduction to the target level is about +/- 5%, or about +/- 10%, about +/- 20%, about +/- 30%, about +/- 40%, or other smaller, intermediate or larger numbers are used. In an exemplary embodiment of the invention, the temporary treatment time starts from when the treatment starts being clinically meaningful. In an exemplary embodiment of the invention, the temporary treatment time ends about when most of the NE level recovers, for example, to over 50% of baseline, or over 60%, over 75%, over 90%, or other smaller, intermediate or larger values. In an exemplary embodiment of the invention, the reduction in renal norepinephrine level is selected to occur at a particular time after treatment, for example, about 14 days post treatment, about 30 days, about 60 days, about 90 days, about 120 days, or other smaller, intermediate or larger time frames are used. In an exemplary embodiment of the invention, a drug is administered in combination with the treatment to reduce release of NE, for example, guanethidine. Optionally, the drug is given to reduce NE to help control the timing of the start of the treatment, for example, the temporary treatment. An aspect of some embodiments of the invention relates to a method for temporarily disrupting the function of nerves, for example, function returns after a decline at 30 days, to at least 40%, at least 50%, at least 60%, at least 70%, at least 80% of a baseline (e.g., pre-treatment function), or other smaller, intermediate or larger values are used. In an exemplary embodiment of the invention, the activity level of at least some of the efferent nerves is temporarily reduced, for example, at least 30% of the nerves, at least 40%, at least 50%, at least 70%, at least 80%, or other smaller, intermediate or larger values are used. In an exemplary embodiment of the invention, the renal norepinephrine levels are selected to be temporarily reduced. In an exemplary embodiment of the invention, the length of time of the temporary effect is selected, for example, to be about 30 days to about 120 days post treatment, or about 30 days to about 90 days, or about 30 days to about 60 days, or about 30 days, or about 15 days to 45 days, or about 60 days to 120 days, or about 60 days to 90 days, or other smaller, intermediate or larger values are used. In an exemplary embodiment of the invention, nerves are treated, for example heated, for example with ultrasound. In an exemplary embodiment of the invention, renal NE levels are measured. In an exemplary embodiment of the invention, the target is a reduction in NE levels, for example, the temporary effect occurs when NE are below, for example, about 30%, about 40%, about 50%, below about 60%, below about 70%, below about 80%, below about 90%, below about 95%, or other smaller, intermediate or larger values are used. In an exemplary embodiment of the invention, the target level of the measured renal NE level to determine that the temporary effect has subsided is, for example, a return to NE level of greater than about 30% (relative to baseline), greater than about 40%, greater than about 50%, greater than about 60%, greater than about 70%, greater than about 80%, or other smaller, intermediate or larger values are used. For example, for the case of reducing blood pressure, a target of renal NE levels of 50% or more can be used to define a return to baseline and the end of the temporary effect, as studies have shown that NE level reductions of less than 50% are not associated with a clinically significant reduction in blood pressure, for example, at least 10 mmHg, 20 mmHg, 30 mmHg, 40 mmHg, or other smaller, intermediate or larger values are used. In an exemplary embodiment of the invention, any part of the temporary disruption period is not associated with significant damage to the nerves, for example, significant nerve damage is not seen on histological examination. Optionally, the histological slides are prepared using any suitable stain, non-limiting examples include; hematoxylin and eosin (H&E) stain, Movat's stain, without being necessarily limiting. Inventors hypothesize that nerves regenerate (e.g., to reinnervate the kidney) recovering renal NE levels after the initial post-treatment decrease in NE level. An aspect of some embodiments of the invention relates to a permanent disruption of nerves that is not associated with significant damage, for example, damage visible on histological examination. Optionally, the efferent and/or afferent nerves can be substantially damaged without significant visually apparent damage. Optionally the damage is thermal damage. An aspect of some embodiments of the invention relates to a method of treating a patient having a medical condition associated with abnormalities of the sympathetic nervous system, for example, over-activation and/or overstimulation of the sympathetic nervous system. Non-limiting examples of clinical conditions include; hypertension, impaired glucose tolerance (e.g., diabetes), sleep apnea, congestive heart failure. In an exemplary embodiment of the invention, the method comprises selectively reducing the activity of the sympathetic nervous system. Optionally, the sympathetic renal nerves (e.g., efferent and/or afferent) are treated to selectively reduce their function. In an exemplary embodiment of the invention, the selective reduction is estimated according to renal NE levels. In some embodiments of the invention, the treatment is temporary, for example, lasting less than 120 days, less than 90 days, less than 60 days, less than 30 days, or other smaller, intermediate or larger values are used. In some embodiments of the invention, the method comprises selectively disrupting the afferent nerves and not substantially disrupting the efferent nerves, for example, the efferent nerves are temporarily affected and the afferent nerves are long term (e.g., permanently) affected. Alternatively, the method comprises disrupting both the afferent and efferent nerves. In an exemplary embodiment of the invention, the treatment is performed intracorporeally, for example, from inside one or both renal arteries. In an exemplary embodiment of the invention, non-focused ultrasound is applied to the renal artery walls at one or more circumferential and/or longitudinal locations. An aspect of some embodiments of the invention relates to a method for verifying a selective reduction in afferent renal nerve function. In an exemplary embodiment of the invention, one or both kidneys are stimulated, and the resulting effect is observed. In an exemplary embodiment of the invention, the method comprises administering an active drug to the kidney to selectively activate the afferent renal nerves, non-limiting examples include; adenosine, bradykinin. In an exemplary embodiment of the invention, the method further comprises making one or more measurements of the blood pressure increase resulting from the drug infusion (e.g., as compared to a pre-treatment baseline and/or pre-drug administration baseline). Optionally, the method further comprises comparing the measured increase in blood pressure to an increase in blood pressure caused by administering substantially the same amount of drug before the treatment to the same subject. Alternatively or additionally, the method further comprises comparing the measured increase in blood pressure to an expected increase in blood pressure. The expected increase in blood pressure can be estimated, for example, from correlations between a concentration of the drug and resulting increases in blood pressure for given reductions in afferent nerve dysfunction. In an exemplary embodiment of the invention, the comparison provides an estimate of the reduction in afferent nerve function, for example, a pre-treatment increase in blood pressure by adenosine of 40 mmHg (e.g., systolic) and a post-treatment increase by substantially the same amount of adenosine of 20 mmHg is associated with a reduction in function, for example, a 50% reduction in function. Alternatively or additionally, the nerves can be electrically stimulated (e.g., by insertion of one or more electrodes) to measure the reduction in function. For example, electrical stimulation of efferent nerves can be measured by constriction of the renal artery. For example, electrical stimulation of afferent nerves can be measured by an increase in blood vessel. For purposes of better understanding some embodiments of the invention as described herein, reference is first made to the structure and function of the sympathetic nervous system. It should be noted that the explanation is for illustrative purposes only. If one or more hypotheses are subsequently found to be incorrect, some embodiments of the invention are still considered to be valid without prejudice. Figure 1 is a simplified diagram of the sympathetic nervous system, useful for practicing some embodiments of the invention. A brain 100 sends signals to a left kidney 102A and/or a right kidney 102B through efferent nerves 104. Overactivity of the sympathetic nervous system, for example in the form of excessive signaling by efferent nerves 104, provides excessive stimulation to kidneys 102A-B and/or kidneys are overly sensitive to the stimulation. Over stimulated kidneys 102A-B cause hypertension by one or more mechanisms, for example; increased renal vasculature resistance (e.g., less water filtered by the kidney, more stays in the blood causing hypertension), increased sodium retention (e.g., high sodium content maintains a high blood volume, causes hypertension), and/or increased release of rennin (e.g., kidney hormone that causes hypertension by various mechanisms including constriction of peripheral blood vessels). Efferent nerves 104 communicate with kidneys 102A-B by sending a chemical signal (e.g., neurotransmitter) called norepinephrine 114 (shown as small spheres). Excessive signaling by efferent nerves 104 produces an excessive amount of norepinephrine 114 which spills into the blood stream. The amount of norepinephrine 114 spilling into blood is measurable (e.g., norepinephrine spillover NESO), and provides a measurement as to the activation of the efferent sympathetic nervous system. Alternatively, biopsies of the kidneys can be taken to estimate the renal norepinephrine concentration directly. The biopsy technique is potentially useful in animal studies. However, any suitable measurement method can be used. Inventors hypothesize that NESO and renal NE content are substantially linearly related to each other, however this hypothesis is non-limiting and does not impact the function of the embodiments. Kidneys 102A-B communicate back to brain 100 by afferent nerves 106. Over- activation of afferent nerves 106, for example in the form of excessive signaling, can be caused by a sick kidney, for example, end stage renal disease. Brain 100 detects the over-stimulation of afferent nerves 106, and sends signals to one or more body systems. The over- activation of body mechanisms and/or organs leads to medical problems. Non- liming examples include; over- activation of a heart 108 leading to heart failure and/or arrhythmias, sleep apnea leading to sleeping problems (shown as ZZZ), constriction of peripheral blood vessels 110 leading to hypertension, increased insulin resistance leading to diabetes (shown as hamburger 112), and/or activation of the kidneys in a positive feedback cycle. In some embodiments of the invention, the diameter of the axons of nerves is, for example, 0-50 micrometers, or about 50-100 micrometers, or about 100-200 micrometers, or about 200-500 micrometers, or greater than 500 micrometers, or other smaller, intermediate or larger diameters. In some embodiments of the invention, nerves are unmyelinated. Alternatively or additionally, nerves are myelinated. Optionally, one or more nerves are surrounded by fat. In some embodiments of the invention, the renal arteries are accessed by a radial artery approach, for example, by use of a catheter. The systemic over- activation of the sympathetic nervous system can be measured, for example by microneurography (insertion of a needle near a nerve and measuring the muscle sympathetic-nerve activity (MSNA)), whole body norepinephrine spillover, and/or any other suitable techniques. Figure 2A is a method of treatment, in accordance with an exemplary embodiment of the invention. In an exemplary embodiment of the invention, the activity levels of nerves (e.g., efferent and/or afferent) innervating the kidney are selectively reduced. Optionally, the nerve disruption is selected to be temporary. The method described in the flowchart is necessarily non-limiting. For example, some steps are optional. Furthermore, there can be other methods and/or other apparatus used to obtain the results. At 202, the nerve reduction profile is optionally selected, in accordance with an exemplary embodiment of the invention. The below and/or figures 4A-B are examples of parameters of the profile. In an exemplary embodiment of the invention, the reduction in NE level is selected, the reduction being associated with the reduction in nerve activity. Optionally, the reduction in NE at a period in time is selected. Optionally or additionally, the reduction is selected to be temporary. Optionally or additionally, the efferent nerves are selected to be temporarily affected or substantially permanently affected (e.g., can take a relatively long time to regenerate, or not regenerate at all). Selection can be performed, for example, by one or more of; doctor, manufacturer, the device itself (e.g., software), by the number of repetitions required. At 204, the treatment parameters associated with achieving the selected nerve reduction profile as in 202 are optionally selected, in accordance with an exemplary embodiment of the invention. One or more non-limiting examples of factors that can affect the nerve reduction profile include; intensity of energy (e.g., ultrasound), frequency of ultrasound, time per treatment application, number of treatment locations and/or sites, area and/or volume of tissue to be targeted, position of treatment and/or locations in the renal artery. Alternatively, the tissue is not located around the artery, for example, any suitable target location in the body. At 206, the patient is treated according to the selected parameters as in 204, in accordance with an exemplary embodiment of the invention. In an exemplary embodiment of the invention, the patient is treated using non-focused ultrasound energy applied to the target in the renal artery wall from a catheter. Optionally there is no significant effect on the wall. Alternatively, one or more other forms of energy are used, non-limiting examples include; microwave, RF, laser, focused ultrasound. Optionally, at 208, the treatment is repeated, in accordance with an exemplary embodiment of the invention. Optionally, the treatment is repeated to obtain the desired target level, for example, if the target level has not been reached. Optionally, the same treatment is repeated, for example, at the same locations and/or the same parameters. The treatment can be repeated immediately during the current procedure, and over after a period of time during a subsequent procedure. Figure 2B is a detailed method according to an exemplary implementation of a method according to figure 2A. It should be noted that the method described in the flowchart is necessarily non-limiting. For example, some steps are optional. Furthermore, there can be other methods and/or other apparatus used to obtain the results. Optionally, at 220, a decision to treat is made, for example, as will be described in the section "DECIDE TO TREAT". Optionally, at 222, a decision is made to achieve the treatment using the afferent nerves only, or both the afferent and efferent nerves, for example, as will be described in the section "EXEMPLARY NERVE TYPE SELECTION". At 224, a decision is made as to the amount of the reduction in NE, for example, as will be described in the section "EXEMPLARY SELECTION OF NERVE ACTIVITY REDUCTION". Optionally, at 226, a decision is made if the reduction in NE is temporary, for example, as will be described in the section "EXEMPLARY SELECTION OF NERVE ACTIVITY REDUCTION". In some embodiments of the invention, 224, 226, 228 occur substantially simultaneously, for example, as part of selection of the treatment profile. Alternatively, other orders are available, for example, 226, 228, 224. At 228, treatment parameters to obtain the selected reduction in NE are determined, for example, as will be described in the section "TREATMENT PARAMETERS". At 230, the patient is treated, for example as will be described in the section "TREATMENT AND EXEMPLARY DEVICE". Optionally, at 232, feedback is obtained about the treatment, for example, as will be described in the section "FEEDBACK". In an exemplary embodiment of the invention, a decision to treat a patient by selectively affecting and/or modulating the functionality of the innervation to and/or from the kidney is made, for example, by a physician according to clinical indications. In an exemplary embodiment of the invention, the patient is suffering from a medical condition associated with an over-active sympathetic system. Optionally, the over- activity is associated with the kidney. For example, the kidney can be over- activated by efferent nerves, the kidney can over-activate the systemic sympathetic system by overactivating the central nervous system through afferent nerves. In some cases, the afferent and efferent nerves provide positive feedback, further exacerbating medical conditions. Studies have shown that one or more of the following medical conditions are associated with the over-active sympathetic system; hypertension, congestive heart failure, sleep apnea, and/or insulin resistance. The list is meant to be non-limiting, as in the future other medical conditions may be found to be associated with over activating of the sympathetic system that can be treated as described herein. In some embodiments of the invention, measurements associated with the patient' s baseline sympathetic nervous system activity are obtained, for example, one or more of; renal norepinephrine spillover (e.g., associated with renal sympathetic nerve activity), renal whole body spill over and/or microneurography to measure muscle sympathetic-nerve activity. Optionally, invasive measurements are obtained, for example, renal norepinephrine concentration (e.g., by biopsy), for example, when measuring the baseline of an animal (e.g., pig) for example, before experiments and/or when comparing treated animal to control (e.g., untreated). In some embodiments, the baseline measurements are used to select reduction targets, for example in relation to the baseline. Optionally or additionally, subsequent measurements are obtained to determine if the target has been met. Potentially, the patient's medical condition will improve by selective reduction in nerve activity, for example, of the renal nerves. Figures 3A-3C are schematics illustrating selective reduction in nerve activity according to the type of nerves, in accordance with an exemplary embodiment of the invention. In an exemplary embodiment of the invention, selective reduction in nerve activity (e.g., end-organ neural activity) is achieved by disrupting one or more nerves. Optionally, at least some nerve activity (e.g., end-organ neural activity) is maintained, for example, by not disrupting activity to one or more nerves. Optionally, nerve activity is selectively reduced in the efferent nerves. Optionally or additionally, nerve activity is selectively reduced in the afferent nerves. Alternatively, nerve activity is selectively reduced in both efferent and afferent nerves. Figure 3A is a simplified schematic of a brain 300 (e.g., central nervous system) and a kidney 302 (one kidney is shown for simplicity) communicating through nerves. Efferent nerves 304 transmit signals from brain 300 to kidney 302. Afferent nerves 306 transmit signals from kidney 302 to brain 300. Three efferent 304 and afferent 306 nerves are shown for illustrative purposes only. In an exemplary embodiment of the invention, nerves 304 and 306 are treated at a location 308, for example, the wall of the renal artery and/or aorta. In most cases, at location 308, nerves 304 and 306 travel relatively close together, and treatment reduces the activity of both nerves 304 and 306. Optionally, a reduction in NE is associated with a reduction in activity of efferent nerves 304, for example, as described with reference to figure 1. Optionally, a reduction in NE (e.g., the reduction without the rise in NE) is used as a target to the reduction in activity of afferent nerves 306, as inventors hypothesize that afferent 306 and efferent 304 nerves are affected substantially in equal amounts, due to their close proximity to each other, similar sizes, similar locations in the artery wall and/or both being substantially unmyelinated. Optionally, the target is linked to the percentage of the nerves being affected, for example, a table can be used to correlate the target level and the percentage of affected nerves. Figure 3B illustrates the selective reduction in nerve activity of both efferent 304 and afferent 306 nerves, for example, as occurs during the time period after the treatment. For illustrative purposes, reduction in nerve activity is shown as a reduction in the number of efferent 304 and afferent 306 nerves that are continuous (e.g., uncut), from three to one. In some embodiments of the invention, the nerves are treated so that the reduction in function of afferent and/or efferent nerves is substantially permanent. Optionally, the amount of energy (e.g., ultrasound) applied is sufficient to substantially permanently damage the nerves, for example, by causing a thermal effect. Optionally, the energy is applied to damage the axons, so that the axons are unable to substantially recover and/or regenerate, for example, to return to clinically significant function. Potentially, selectively reducing activity of the efferent nerves reduces hypertension by preventing and/or reducing over- activation of related kidney functions such as rennin release, sodium retention and/or blood filtration. Potentially, selectively reducing activity of the efferent nerves protects a diseased kidney (e.g., diabetic kidney) from overactivation and further damage. Figure 3C illustrates at least some recovery of efferent nerve 304 function. Studies have shown that in some cases efferent nerves have the ability to regenerate and/or recover at least some of their function. Studies have shown that in most cases treated afferent nerves 306 (e.g., heated) do not regenerate and/or recover function, at least not to a significant degree (e.g., measurable and/or clinically relevant). In some embodiments of the invention, the nerves are selectively treated so that the damage to efferent nerves 306 is temporary. For example, at least some of nerves 306 are able to regenerate and re-innervate kidney 302 (re-generated nerve segment shown as dotted line 310). Optionally, efferent nerves 306 are selectively treated to recover enough function to achieve a clinically significant difference, for example, returning to 50% or more of the baseline function and/or NE measurement. For example, the recovered clinical state of the patient does not significantly differ from the baseline clinical state (e.g., before treatment). Optionally, efferent nerves 306 are selectively treated, or are planned to recover to a predetermined NE level, for example, to return to at least 30% of the baseline NE level, or at least 40%, at least 50%, at least 60%, at least 70%, at least 80%, or other smaller intermediate or larger values are used. Alternatively, efferent nerves 304 are selectively treated so that even with regeneration and/or recovery, the nerve function does not substantially return. For example, the clinical state of the patient remains significantly different from baseline, (e.g., clinical effect is not temporary). In some embodiments, efferent nerves 306 are selectively treated so that NE levels remain below a predetermined threshold, for example, to remain below, for example, about 30% of the baseline NE level, or below about 40%, about 50%, about 60%, about 70%, about 80%, or other smaller, intermediate or larger values are used. In an exemplary embodiment of the invention, the energy (e.g., ultrasound) is applied to selectively treat afferent 306 and/or efferent 304 nerves without causing significant chronic damage (e.g., post acute treatment) that is visible on histological examination, for example, nerves are not seen to be affected. Optionally or additionally, there is no significant damage to tissues surrounding nerves on histological examination. In some embodiments, the nerves are damaged, even through the damage is not visible on histological examination, for example, nerves are unable to conduct signals. Optionally or additionally, there is no significant damage to the renal artery (e.g., inner surface, stenosis), for example, on histological examination and/or angiography. The chronic phase can be defined, for example, as after about 30 days, after about 60 days, after about 90 days, after about 120 days, or other smaller, intermediate or larger values are used. Without being bound to theory, selectively reducing activity of the afferent nerves can provide for a systemic reduction in sympathetic nervous system activation. Potentially, the over-activation is caused by the kidney, such as a diseased kidney (e.g., ischemia). Potentially, reduction in systemic sympathetic nervous system activity treats medical conditions, for example, hypertension, sleep apnea, and/or congestive heart failure. Figure 4A is a graph illustrating selective reduction in nerve activity, in accordance with an exemplary embodiment of the invention. In an exemplary embodiment of the invention, it is desirable to maintain some of the natural feedback controls over blood pressure and/or other biological functions, provided by the nerve (e.g., as part of a biological system), albeit, at an attenuated level, for example, to compensate in part or in full and/or overcompensate for a diseased state caused by such feedback. It has, in fact, been found that even partial denervation which only causes a drop of Renal Norepinephrine spillover to about 50% from baseline (e.g., in a diseased patient), still provides a significant drop in blood pressure. Furthermore, the consequences of total (afferent and/or efferent) renal denervation over a relatively long time are not clear and it may be desirable to avoid. In an exemplary embodiment of the invention, the target reduction in renal norepinephrine level is selected. Optionally, the reduction in nerve activity (e.g., signaling) is selected, with the norepinephrine level being correlated with the activity of the nerves. Optionally, the NE levels are correlated with a treatment outcome, for example, with a selected reduction in one or more measurements, for example; blood pressure, left ventricular mass index, plasma glucose concentration, hemoglobin Ale, apnea-hypopnea index. Correlation can be based on experimental data from many patients, data from previous treatments of the same patient, mathematical models of the sympathetic nervous system, and/or a 'best guess' by the physician, and/or the NE itself is a target. In an exemplary embodiment of the invention, the reduction is nerve activity and/or nerve function is selected to be below a target threshold (e.g., relative to a baseline), for example, below about 20% of baseline, about 30%, about 50%, about 80%, about 90%, or other intermediate or larger amounts. Alternatively or additionally, the reduction in nerve activity and/or nerve function is selected to be within a range, for example, about 20%-80% of baseline, about 10%-50%, about 30%-60%, about 25%- 75%, about 25%-50%, about 10%-40%, or other smaller, intermediate or larger ranges are used. Nerve function can be measured, for example, by electrical activity (e.g., inserting needles and measuring signals), two needles and measuring transit of signal, or any other suitable techniques. In an exemplary embodiment of the invention, the reduction in renal NE level is selected relative to the baseline measurement, for example, obtained before treatment and/or relative to control. In a real patient, the renal NE level does not need to be measured directly, for example, the NE reduction percentage can be expected from the treatment parameters. Alternatively, non-invasive measurements are performed to obtain a baseline, for example, NESO. For example, a reduction of about 50%, about 60%, about 70%, about 75%, about 80%, about 90%, about 95%, or other smaller or intermediate numbers are used. For example, a reduction of at least 50%, at least 60%, at least 70%, at least 80%, at least 90%, or other smaller, intermediate or larger values are used. Optionally or additionally, the reduction is a target zone, for example, to a level about 5% to about 50% of baseline, or about 30% to about 50% of baseline, or about 40% to about 50% of baseline, or about 25% to about 75% of baseline, or other smaller, intermediate or larger values are used. Optionally, the reduction in renal NE is selected to have a desired clinical effect. Inventors discovered that, at least in some cases, renal NE levels continue to decrease steadily over a period of time. Therefore, in an exemplary embodiment of the invention, the maximal reduction in renal NE level is selected to occur at time period after the treatment (shown as 'target time'). For example, the maximal reduction is let to slide to about 14 days post treatment, about 30 days, about 45 days, about 60 days, about 90 days, about 120 days, or other smaller, intermediate or larger time frames are used. Without being bound to theory, inventors hypothesize that selective disruption of nerves without visible histological damage occurs, for example, due to heating of small blood vessels that support the renal nerves (e.g., epineurium and/or vasa nervosum). The disruption in the blood supply could be biochemically disrupting the ability of the nerve to propagate chemical and/or electrical signals across the treated area. Figure 4B is a graph illustrating the selection of a temporary reduction in nerve activity, in accordance with an exemplary embodiment of the invention. Inventors discovered that renal NE levels decrease gradually over time, followed by a gradual increase in renal NE levels. /or the time after treatment during which the target NE level is reached are selected as described with reference to figure 4A. In an exemplary embodiment of the invention, the length of time having the reduced NE levels (e.g., temporary effect) is selected as the period of time during which the renal NE levels are below or within the selected threshold. In an exemplary embodiment of the invention, the length of time of the temporary effect is selected, for example, to be about 2 weeks, about 1 month, about 2 months, about 3 months, about 4 months or other smaller, intermediate or larger time frames are used. In a non-limiting example, the time period is selected to provide enough time for a patient to undergo an operation. For example, in a patient suffering from transient ischemic attacks, hypertension can be transiently treated for 3 months, to allow enough time for the patient to undergo carotid endarectomy. In an exemplary embodiment of the invention, the renal NE levels continue to recover after the temporary period. For example, the renal NE levels return to over about 50% of the initial baseline value, or over about 60%, or over about 70%, or over about 80%, or over about 90%, or over about 95% of the initial baseline value, or other smaller, intermediate or larger values are used. In an exemplary embodiment of the invention, treatment parameters are determined to achieve the selected reduction profile in renal norepinephrine levels (e.g., amount reduction over time). In an exemplary embodiment of the invention, a catheter delivering non-focused ultrasound is used to provide treatment, and the treatment parameters are related to the ultrasound delivery. Alternatively, treatment parameters are correlated with other energy delivery methods and/or devices. Optionally, the treatment parameters are directly correlated with reduction in NE levels. Alternatively, the treatment parameters are indirectly correlated with the reduction in NE levels, for example, the treatment locations and related areas of treatment are selected, the NE levels being correlated with the locations and areas. • Time of treatment: The period of time of application of energy (e.g., ultrasound) to the treatment area. For example, about 1 second - 60 seconds, or about 1-5 seconds, about 1-3 seconds, about 10-30 seconds, about 15-45 seconds, or other smaller, intermediate or larger time frames are used. In some embodiments, a relatively longer period of treatment time produces a relatively larger reduction in renal NE levels. • Frequency of ultrasound: The frequency of the applied ultrasound energy. For example, from about 1 Mhz - about 40 Mhz, or about 5 Mhz, about 8 MHz about 10 MHz, about 15 MHz, about 20 MHz, about 30 Mhz, or other smaller, intermediate or larger frequencies are used. In some embodiments, a relatively lower frequency produces a relatively larger reduction in renal NE levels. • Intensity of treatment: The intensity of the applied energy. For example, for ultrasound, high intensity comprises, for example, about 10-20, or about 21-30 or about 31-40, or about 41-50 or about 51-60 or about 61-70 or >= about 71 Watt/square centimeter, or other smaller, intermediate or larger values are used. In some embodiments, a relatively higher intensity produces a relatively larger reduction in renal NE levels. Optionally, the signal is continuous. Alternatively, the signal is pulsed. In some embodiments of the invention, geometrical parameters of the treatment are selected to obtain the desired reduction in nerve activity. The geometrical plan is then correlated with the treatment parameters (e.g., time, frequency, intensity), for example, as described in more detail in PCT application IB2011/054640 by the same inventor (Sverdlik et al. ), incorporated herein by reference in its entirety. Optionally, the geometrical plan is associated with mapped locations of the nerves around the renal artery, for example, as described by Serge Rousselle in the presentation "Experimental Pathways for the Evaluation of Extrinsic Renal Nerve Distribution, Density, and Quantification (Swine Model)", presented at the TCT conference, 2011, incorporated herein by reference in its entirety. Rousselle and/or Atherton et al. 2011 discovered that a significant percentage of the renal nerves are located within about 2mm from the artery wall, for example, about 0.5mm-2.5mm from the wall. Furthermore, nerves are located with no specific distribution in the artery circumference. Advantageously, these distances are within the damage/targeting capability of the ultrasonic element of some embodiments. One vs two kidneys: The nerves associated with a single kidney (e.g., left or right) or with both kidneys can be treated. In some embodiments, treatment of both kidneys achieves a relatively larger reduction in renal NE levels. Optionally, both kidneys are treated differently, for example, different transient effects and/or durations. Alternatively, both are treated the same. The volume of a treatment region: In some embodiments, the larger the treatment region, the larger the number of affected nerves, and the larger the reduction in renal NE levels. The more the treatment region overlaps with nerve-holding areas, the larger the reduction in NE levels. Optionally, an imager is used to find the nerves. In an exemplary embodiment of the invention, the shape of the treated area is substantially square and/or round, for example, the ratio of the average width to average depth is about 1: 1 or about 0.5: 1, or about 1.5: 1, or about 2: 1, or other smaller, intermediate or larger values are used. The average trans-axial extent is, for example, about 1mm, about 2mm, about 3mm, about 4mm, about 5mm, or other smaller, intermediate or larger values are used. The location of the treatment region: The location of the treatment region in the type of tissue (e.g., media, adventitia, peri-adventia) and/or the distance from the treatment region to the arterial wall (e.g., measured in millimeters). In some embodiments, the location of the treatment region is selected to target relatively more or relatively less nerves to obtain a relatively larger or smaller reduction in NE levels, for example, the number of nerves having been mapped as a function of the distance from the inner arterial wall, for example, as described by Serge Rousselle, for example, about 0.5-2.5 mm. Number of circumferential locations around the artery: For example, 1, 2, 4, 6, 8, or other smaller, intermediate or larger number of locations. Optionally, the locations are substantially equally spaced around the circumferences, for example, 4 locations are spaced at 90° as 12, 3, 9 and 6 o'clock. It is hypothesized that the renal nerves surround the renal artery, without being concentrated in a particular location. In some embodiments, having a relatively larger number of circumferential locations around the artery covering a relatively larger arc length achieve a relatively larger reduction in renal NE levels. Number of location along the length of the renal artery: For example, 1, 2, 3, 4, or other larger number of locations are used. In some embodiments, treatment at two or more locations along the length of the renal artery achieve a relatively larger reduction in renal NE levels, for example, by treating nerves at the second location that were missed during the treatment of the first location. In an exemplary embodiment of the invention, the ultrasound beam is broad (e.g., non-focused), for example, a cross sectional dimension of the beam (e.g., the smallest dimension) is larger than about 0.1 mm, or about 0.3mm, or about 0.5 mm, or about 0.7 mm, or about 1.0 mm, or about 1.5 mm, or about 1.7 mm, or about 2.0 mm, or about 2.5 mm, or about 3.0 mm, or about 4.0 mm, or about 5.0 mm, or other smaller, intermediate or larger sizes are used. Optionally the beam is narrow, for example, diverging less than about 5 degrees, 10 degrees, 15 degrees, 20 degrees, 30 degrees, or other smaller, intermediate or larger values are used. In an exemplary embodiment of the invention, the treatment area is, for example, between 50% and 200% of the transducer dimension (e.g., can also be somewhat defocused). In some embodiments of the invention, the ultrasound beam is focused, for example, having a focal length ranging from, for example, about 1cm - 10 cm, or about 2cm- 10 cm, or about 2cm-3cm, or about lcm-3cm, or about 2 cm, or about 2.5 cm, or about 3.0 cm, or other smaller, intermediate or larger ranges or values. Optionally, the beam is focused in one or two dimensions. Figures 5 A and 5B illustrate exemplary geometrical treatment parameters. Figure 5A illustrates a right renal artery 500A, connecting an aorta 502 to a right kidney 504A. A left renal artery 500B connects aorta 502 to a left kidney 504B. Two locations 506A-B along the length of right renal artery 500A and two locations 506C-D along the length of left renal artery 500B are illustrated as possible treatment sites. Figure 5B illustrates a cross sectional view through right renal artery 500A, along treatment location 506A. From the inside of a lumen 508 outwards, the tissue layers are an intima 510, a media 512, an adventitia 514, and a perivascural region 516. Regions 518A-D distributed around the circumference are shown as possible treatment regions, for example, at about 0 degrees, at about 90 degrees, at about 180 degrees and at about 270 degrees, corresponding to 3, 6, 9, and 12 o'clock. However, other numbers of treatment locations at other angles or points are possible, for example, 1, 2, 3, 6, 8, or other smaller, intermediate or larger numbers of area. Regions 518A-D are shown as being selected to treat nerves in adventitia 514 and/or periarterial region 516, however, other targets are also possible, for example, media 512. In some embodiments of the invention, the radial distance and/or radial thickness of target regions 518A-D are selected to substantially correspond to the locations of nerves, for example, about 0.5mm-2.5mm from the inner wall (or intima 510), or about 0.5mm- 1.0 mm, about 0.5mm- 1.5mm, about 0.5m-2.0mm, about 1.0mm-2.5mm, about 1.0mm-2.0mm, or other smaller, intermediate or larger distances are used. In some embodiments of the invention, regions are evenly spaced around the circumference. Alternatively, regions are evenly spaced along the length of the artery. Optionally, all regions get the same treatment (e.g., time, power, freq). Alternatively, different settings are used for different regions. In some embodiments of the invention, regions are located outside of the artery, for example, in other tissue, as represented by region 518B. In an exemplary embodiment of the invention, the area of the renal artery wall that is treated is about 0.01%-25%, about 0.1-10%, about l%-5%, about 0.1%-3%, or other smaller, intermediate or larger values are used. In an exemplary embodiment of the invention, the size of the treated region (e.g., regions 518A-D) is ranges from about 1 mm 2 - 20 mm 2 or about 4 mm 2 - about 15 mm 2 , or about 6 mm 2 - about 10 mm 2 , or other smaller, intermediate or larger values are used. In an exemplary embodiment of the invention, regions 518A-D are heated, for example, by a catheter inserted inside the artery. In an exemplary embodiment of the invention, the patient is treated according to the selected treatment parameters. Figure 6 is a schematic illustration of an exemplary treatment system 1600, according to an exemplary embodiment of the invention. System 1600 provides for the control of the ultrasound treatment and/or monitoring of the treatment using a catheter 1222. It should be noted that system 1600 is non-limiting, and other suitable devices can be used. In an exemplary embodiment of the invention, an operator (e.g., physician performing the procedure) programs a controller 1602 (e.g., computer) for treatment using a user interface 1604 (e.g., keyboard, mouse, monitor). Optionally, treatment is monitored, for example, by viewing feedback parameters on interface 1604. In this and other embodiments, potentially less sophisticated user interfaces may be used as well, for example, using a multi-position knob to select between protocols, times and/or desired effects. Alternatively, several switches or knobs may be available. In some embodiments, the system automatically selects settings and/or a suggested result, for example, based on patient information or imaging results. Optionally, a table or database or rule set and/or functional mapping component of other type are provided to map between input data and treatment parameters and/or expected results. In an exemplary embodiment of the invention 1604 comprises a display for displaying, for example, parameters related to treatment, for example, settings and/or real time parameters. Non-limiting examples of displayed items include; time of current treatment, blood temperature, set ultrasound frequency, set ultrasound treatment. In an exemplary embodiment of the invention, a control port 1606 provides electrical power to electrodes across element 102, causing element 102 to vibrate at the set frequency, outputting a set ultrasound intensity profile. In some embodiments of the invention, control port 1606 serves as input to controller 1602 from catheter 1222 and/or transducer 300. Non-limiting examples of input include; imaging data, efficiency information, impedance of transducer, temperature of blood. In an exemplary embodiment of the invention, catheter 1222 comprises an acoustic element 102 (e.g., part of transducer 300) to deliver ultrasonic energy to selectively treat nerves. In an exemplary embodiment of the invention, transducer 300 is capable of relatively high intensity ultrasound output. An example of a suitable acoustic emission element is described, for example in PCT application IB2011/054635 by the same inventor (Sverdlik et al. ), incorporated herein by reference in its entirety. In some embodiments, contact between an acoustic element 102 of transducer 300 and a wall of a blood vessel (e.g., renal artery), is reduced and/or prevented, for example, by a separation device, for example as described in more detail in PCT application IB2011/054638 by the same inventor (Sverdlik et al. ), incorporated herein by reference in its entirety. Optionally, the separation device maintains a distance between element 102 the blood vessel wall of at least 1mm. A zoom-in schematic of transducer 300 is illustrated. In an exemplary embodiment of the invention, transducer 300 comprises of a substantially rectangular and planar ultrasound element 1702, for example, a piezoelectric element. A length of element 1702 is, for example, about 1mm, about 2 mm, about 4 mm, about 6 mm, about 8 mm, about 10 mm, or other smaller, intermediate or larger lengths are used. A width of element 1702 is for example, about 0.2 mm, about 0.6 mm, about 1.0 mm, about 1.4 mm, about 2.0 mm, or other smaller, intermediate or larger widths are used. In an exemplary embodiment of the invention, electrodes 1704A-B are located on opposite sides of element 1702. Electrodes 1704A-B provide an alternating voltage gradient which causes element 1702 to emit ultrasound energy. In an exemplary embodiment of the invention, element 1702 is suspended above a support board 1706, for example, by a plurality of attachment areas 1708. In a non- limiting example, areas 1708 are drops of a non-conductive material such as glue. In an exemplary embodiment of the invention, a gas (e.g., air) bubble 1710 is suspended between element 1702 and board 1706. Without being bound to theory, bubble 1710 provides for element 1702 to vibrate efficiently and emit relatively high intensity ultrasound energy. In an exemplary embodiment of the invention, a memory 1720 is coupled to controller 1602. Optionally, memory 1720 stores one or more parameters related to the treatment plan (e.g., correlation values), non-limiting examples include; selected reduction in nerve function correlated with time, intensity, frequency, and/or other values as described herein. In an exemplary embodiment of the invention, a feedback module 1730 is coupled to controller 1602. Optionally, module 1730 is programmed to analyze returning signals from catheter 1222, non-limiting examples include; efficiency of transducer, impedance, blood temperature. Optionally, module 1730 adjusts one or more settings to obtain the desired results, and/or stops the transmission of energy if there is a safety issue. In an exemplary embodiment of the invention, an imaging module 1740 is coupled to controller 1602. Optionally, module 1750 is programmed to analyze returning signals from transducer 300, for example, to image the arterial wall using ultrasound energy. In some embodiments of the invention, catheter 1222 is sold pre-marked and/or pre-packaged with settings to obtain the desired effect. Optionally, memory 1750 is coupled to catheter 1222 and contains the settings. In some embodiments, catheter 122 is plugged into controller 1602, for example through port 1606, programming controller 1602 with the settings of catheter 1222 (e.g., on memory 1750). Some non-limiting examples of possible catheters 1222 include; a catheter with pre-settings for reducing renal nerve function by at least 50%, a catheter with pre-settings for reducing renal NE levels by at least 50%, a catheter with pre-settings for temporarily reducing nerve function, or other settings as described herein are possible. In an exemplary embodiment of the invention, system 1600 comprises a biopsy device 1740, for example, a needle. Optionally, device 1740 is used to obtain a kidney biopsy to measure NE levels. In an exemplary embodiment of the invention, one or more functions and/or parameters and/or settings are programmed and/or set into controller 1602 and/or stored on memory 1720 (e.g., automatically determined by software such as according to a treatment plan). Optionally or additionally, one or more functions and/or parameters are selectable (e.g., manually set by a user, automatically selected by software). • Efficiency is the estimated efficiency of converting electrical energy into ultrasound energy by the acoustic element. Further details related to efficiency can be found for example in PCT application IB2011/054636 by the same inventor (Sverdlik et al. ), incorporated herein by reference in its entirety. • Navigation system controls the movement and/or positioning and/or orientation of catheter 1222 and/or transducer 300. • Electric power is the applied power to the transducer. Optionally, the applied voltage and/or current are measured. • Frequency of the produced ultrasound energy. • Waveform applied to the acoustic element, for example, a sinusoidal wave. • Intensity is the produced ultrasound power divided by the surface area of the acoustic element. • Pulse duration is the length of a pulse of acoustic energy measured in time. • Duty cycle is the percentage of time in a single pulse that ultrasound energy is transmitted. • Target temperature is the estimated and/or measured temperature of the targeted area. • Energy delivery pattern is the spatial and/or temporal combination of one or more of the above variables, for example, a single pulse, a sequence of pulses, a train of pulses. • Correlation parameters between selected reductions in nerve activity (e.g., NE levels) and treatment parameters (e.g., frequency, time, intensity) and/or geometrical parameters (e.g., number of locations, size of treatment area). In some embodiments, a table of correlation parameters is used. Alternatively or additionally, one or more equations provide the correlation. In an exemplary embodiment of the invention, feedback associated with the treatment is obtained. Feedback is obtained at one or more points in time, non-limiting examples include; during the treatment itself, the same day post-treatment (e.g., about 2- 24 hours), at about 7 days post treatment, about 2 weeks, about one month, about 3 months, about 6 months, about 12 months, about 24 months post treatment, or other smaller, intermediate or larger time frames are used. Optionally, a baseline measurement is performed before the procedure. In an exemplary embodiment of the invention, measurements are performed to assess the accuracy of the selected reduction in renal NE and/or selected reduction in activity of efferent nerves, for example, by measuring renal norepinephrine spillover. In some embodiments of the invention, measurements are performed to assess the effect of the reduction in systemic sympathetic activity by the afferent and/or efferent nerves, for example, by measuring whole body norepinephrine spillover and/or microneurography. In some embodiments of the invention, a clinical exam is performed and/or clinical measurements are obtained to assess improvements in the treated medical conditions. Non-limiting examples include; blood pressure, left ventricular mass index, plasma glucose concentration, hemoglobin Ale, apnea-hypopnea index. Figure 10 is a flowchart of a method of assessing the treatment to selectively reduce the function of the afferent renal nerves, in accordance with an exemplary embodiment of the invention. Optionally, the treatment is evaluated to determine if the function of the afferent nerves has been sufficiently reduced to the pre-selected level. In an exemplary embodiment of the invention measurements are performed to assess the accuracy of the selected reduction in activity of the afferent renal nerves. Optionally, at 1000, one or more blood pressure measurements are made to obtain a pre-treatment baseline, in accordance with an exemplary embodiment of the invention. In an exemplary embodiment of the invention, an active drug and/or formulation is administered to the kidney, before the patient is treated. In an exemplary embodiment of the invention, the drug is administered in an amount sufficient to cause a significant increase in blood pressure. Non-limiting examples of formulations include adenosine and/or bradykinin. Non-limiting examples of administering the formulation include; injecting into the renal artery (e.g., will flow to the kidney) such as by a catheter during the procedure, intravenous systemic administration (e.g., needle) such as during an outpatient visit to the doctor. At 1002, the subject (e.g., adult human over 40 or 60 years old, animal such as a pig) has been treated to reduce the function of the afferent renal nerves, in accordance with an exemplary embodiment of the invention. At 1004, an active drug and/or formulation is administered to the kidney to obtain a post-treatment measurement, in accordance with an exemplary embodiment of the invention. In an exemplary embodiment of the invention, the drug is administered in an amount substantially the same as that administered in 1000. Optionally, at 1006, the increase in blood pressure is measured after the administration of the formulation, in accordance with an exemplary embodiment of the invention. In some embodiments, there is no increase in blood pressure, which suggests a complete or nearly complete reduction in afferent renal function. Blood pressure can be measured directly inside the vasculature by a catheter, or by a standard sphygmomanometer, such as in a clinical outpatient visit. The formulation is expected to raise the blood pressure in a manner that is proportion to the concentration of the active ingredient and to the remaining functional afferent nerves. In a non-limiting example, the blood pressure is elevated several seconds to several minutes after administration of the drug, lasting for about 10 seconds to about an hour. Optionally at 1008, the measured post-treatment blood pressure rise is compared to the measured baseline blood pressure rise (e.g., as in 1000). Alternatively or additionally, the measured rise in blood pressure is compared to an expected rise in blood pressure. In some embodiments of the invention, the expected rise in blood pressure is the rise in blood pressure that would be expected, for a given patient profile, due to administration of a given amount of drug, and to a given amount of afferent nerve function. The expected rise can be estimated and/or calculated, for example, using a table of correlation values and/or an equation. The correlation values can be obtained from experimental data on other patients and/or estimated based on physiological models (e.g., estimated from animal data). In a non-limiting example, the values correlated are the 'expected increase in blood pressure' with 'reduction in afferent renal nerve function', for a given 'drug concentration'. Optionally, at 1010, the accuracy of the selective reduction in afferent nerve function is estimated, in accordance with an exemplary embodiment of the invention. For example, complete denervation (e.g., 100% reduction in function) is not expected to result in a rise in blood pressure, while some denervation is expected to result in at least some rise in blood pressure. The correlation between the denervation and resulting blood pressure rise can be obtained for example, from a table of values obtained from experiments, trial and error from this particular patient (e.g., try and see what happens). In some embodiments of the invention, transient attacks of high blood pressure are treated with relatively low reductions in nerve function. In an exemplary embodiment of the invention, a decision is made based on the accuracy as in 1010, for example, to continue treatment or stop treatment. Optionally, the patient is treated again to try and obtain the selected reduction in afferent function, for example, as described in the section "Adjust and Repeat". Additional details related to infusion of adenosine to activate the renal afferent nerves can be found, for example, in the reference by Katholi RE et al., incorporated herein by reference in its entirety. Details related to infusion of bradykinin can be found for example, in the reference by Janssen BJ et al., incorporated herein by reference in its entirety. In another example, the kidney is electrically stimulated, for example, by a catheter, optionally by the catheter emitting the US energy. The resulting reflex can be measured, for example, by the same catheter, another catheter and/or another method and/or device. Non-limiting examples include; measuring the renal-renal reflex, measuring spasm of the renal artery, measuring an increase in blood pressure. In an exemplary embodiment of the invention, treatment is repeated. Optionally, treatment is repeated during the same treatment session, for example, within 5-10 minutes of the previous treatment. Alternatively or additionally, treatment is repeated during one or more subsequent treatment sessions, for example, at about 2 weeks, at about one month, about 3 months, about 6 months, about 12 months, about 24 months, or at other intermediate or larger times. In an exemplary embodiment of the invention, one or more parameters are adjusted during the next treatment session to 'narrow in' on the desired reduced norepinephrine profile. For example, one or more parameters used for the previous treatment session are adjusted relatively higher or relatively lower to obtain a relatively larger or relatively smaller reduction in renal NE levels. In another example, parameters are adjusted to relatively increase the disruption of the afferent renal nerves, for example, to obtain the selected reduction in function (e.g., as measured by infusion of adenosine and/or bradykinin). In another example, parameters are adjusted to relatively increase or relatively decrease the temporary reduction in renal NE levels. In another example, parameters are adjusted to achieve a permanent reduction in renal NE levels (e.g., previously the parameters achieved a temporary effect). It is expected that during the life of a patent maturing from this application many relevant method of reducing renal NE will be developed and the scope of the term reduction of renal NE is intended to include all such new technologies a priori. The term "consisting of means "including and limited to". Reference is now made to the following examples, which together with the above descriptions illustrate some embodiments of the invention in a non limiting fashion. The details provided below can be used in some embodiments, such as described above, for example, defining useful settings, targets and/or feedbacks. Goal: Inventors performed a controlled study to evaluate the clinical feasibility and/or safety of performing a renal denervation procedure in a chronic swine model, in accordance with some embodiments of the invention. • Primary A significant decrease in norepinephrine levels at 30 days and/or at 90 days following the procedure, in the treatment group compared to the control group. • Secondary: Lack of procedure related stenosis in the treated renal arteries at 30 days and/or at 90 days following the procedure. · Equipment: An ultrasound emission element, catheter and control system as described herein and/or in the related applications was used to perform the treatments. A 10 MHz ultrasound emission element was used in the first set of experiments. A 20 MHz element was used in the second set of experiments. • Animals and preparation: All aspects of the study were approved by the Animal Research Committee. A total of 25 Yorkshire domestic swine (weight 70-75Kg) were used for the experiments, where 4, 9 and 4 animals were treated and sacrificed after 14, 30 and 90 days, respectively. Additional 9 untreated animals were used as reference. • Animal preparation: Anatomic eligibility was confirmed by angiography prior to the treatment. No animals were disqualified. The experiment was performed under general anesthesia. Intravenous heparin was administered to achieve an intraprocedural activated clotting time (ACT) >250 seconds. At the end of the procedure the animals were euthanized. In the experimental swine group, the catheter was introduced via a femoral approach to access the renal arteries. Ultrasound treatment, in accordance with some embodiments of the invention, was administered at the main arterial trunks in one or more locations. In each location, the ultrasound energy was directed in up to 4 angles of the arterial circumference (e.g., 0°, 90°, 180°, 270°- equivalent to 12,3,6,9 o'clock in a clock model). Treatment of neural tissue was performed by ultrasonic excitation of 10 or 30 seconds in each treatment location. In actual practice, a smaller or larger number of angles may be used. Ultrasound was applied at an intensity of about 20-30W/cm . The catheter distance from the artery wall will be measured using ultrasonic imaging of the system, prior to ultrasonic excitation, in accordance with some embodiments of the invention. If needed, a distancing device (e.g., as described with reference to PCT application IB2011/054638) can be deployed, as a part of the safety mechanism. Reference: No ultrasonic energy was applied to the 9 swines in the control group. One control swine was cannulated and the catheter was introduced to the renal arteries without ultrasonic energy delivery. Angiography: Angiography was performed during three time periods; prior to the procedure, immediately at the end of procedure, and at 30+2 days and at 90+2 days. Under angiography, each renal artery was examined by a trained physician for stenosis, constriction and/or any abnormalities in blood flow. Biopsy: All experimental and control animals were biopsied. In vivo, open bilateral renal cortex biopsies were conducted in order to perform a norepinephrine (NE) quantitative analysis. The biopsy was taken from the cranial and caudal poles of the kidney under direct vision. Samples were sent to analysis of NE levels in the tissue using HPLC. Histology: The renal arteries and kidneys were perfused, dissected and immersed in 4% formalin prior to histological processing. Pathological examination included looking for any thermal or mechanical damage to the renal arteries and connective tissue, including nerves. Procedure parameters are described for the first set of experiments. An average of about 7.46+1.33 ultrasonic treatment angles were performed in the right renal artery in 2-3 locations along the artery, and about 5.23+2.08 ultrasonic treatment angles were performed in the left artery, in 1-3 focal locations along the artery. In actual practice, a number of treatments can be performed in a number of angles. For example, 1, 2, 4, 8 or other smaller, intermediate or larger treatment angles are available. For example, 1, 2, 4, 6, 8, 12 or other smaller, intermediate or larger numbers of treatment angles can be performed in an artery. Figure 7A illustrates the treatment locations performed during the experiment within the renal arteries, useful in practicing some embodiments of the invention. Some possible treatment locations along the renal artery and/or around the circumference are illustrated. Figure 7B illustrate the four treatment angles of the catheter as visualized under angiography (images), also useful in practicing some embodiments of the invention. A schematic illustration is also shown for reference. A: the ultrasonic emission element facing towards the cranial side of the animal, labeled as 12 o'clock. B: the dorsal or 3 o'clock position. C: the caudal or 6 o'clock position. D: the ventral or 9 o'clock position. Ultrasonic ablations were applied in one of two time durations, 10 seconds or 30 seconds. In actual practice, the treatment time is about 1 second, about 5, 10, 15, 20, 25, 30, 35, 50, 60, 100 seconds or other smaller, intermediate or larger time periods are used. Norepinephrine (NE): Renal tissue NE content was used as a chemical marker of the sympathetic nervous system activity. Denervation of the sympathetic nervous system is associated with a reduction in NE release from the efferent sympathetic nerves terminals, indicating reduced sympathetic nerve activity. NE concentration (normalized) in renal tissue in the treated animals in comparison with the control group. Ultrasound was applied at a frequency of 10 MHz, for 10 seconds or 30 seconds. 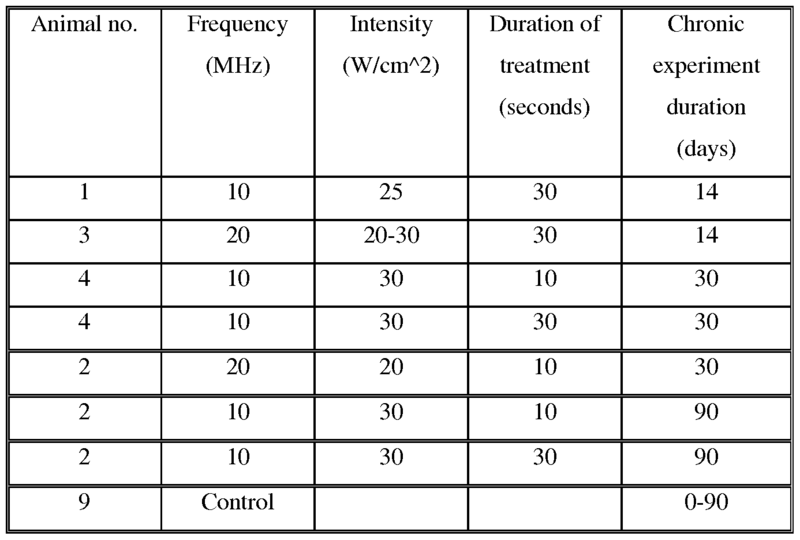 Table 3 shows the average reduction in NE concentration for ultrasound at 20 MHz. Average NE concentration levels (normalized) decreased from reference values after 14 days and further following 30 days post treatment. NE levels at 30 days in the treated animals were reduced to 30.6% in the group treated with 10 MHz for 10 seconds, to 6.8% in the group treated with 10 MHz for 30 seconds, and to 46.2% in the group treated with 20 MHz for 10 seconds. Results at 14 days for the group treated with 20 MHz for 30 seconds showed a reduction of 45%. NE concentration levels increased from 30 days to 90 days, reaching values of 48.9% in the group treated with 10 MHz for 10 seconds, and 49.7% in the group treated with 20 MHz for 30 seconds. Angiography: Neither perfusion defects nor artery constriction were depicted in the treatment group of animals, neither at the treatment time point, nor at the 30 day and 90 day follow up. Mild spasm had occurred coincidently during the treatment, with no sign of permanent spasm or abnormalities remaining or forming de-novo in the 30 days following treatment. Histopathology: At 30 days, a remote, localized and directional thermal effect was achieved in the adventitia and periarterial regions of renal arteries with renal nerve fibrosis. The thermal damage also caused fibrosis in the nerve support tissue (epineurial, perineurial and endoneurial). Quote from the report "Overall, the renal artery changes were of no clinical significance and show no clinically significant damage or narrowing, while showing nerve damage. It is expected that at 90 days the arterial changes will likely not be seen and if present are not likely to be of any physiologic significance". At 90 days, a remote, localized and directional thermal effect was achieved in the adventitia and periarterial regions of renal arteries with renal nerve fibrosis. Quotes from the report: "Overall the histologic changes associated with nerve injury within the soft tissue surrounding the renal arteries were variable ranging from mostly minimal focal myxoid degeneration; some with a single fascicle showing mild perineural chronic inflammation to few with moderate peri/epineural chronic inflammation with partial nerve fascicle effacement and fibrosis. The peri/epineural inflammation was observed mostly in a single fascicle of the examined section. Other nerve fascicles within the vicinity were either unremarkable or only showed focal minimal myxoid changes.... There was no microscopic evidence of luminal narrowing in the examined sections... Overall the ultrasound ablation device in renal arteries did not show unexpected deleterious findings in the chronic phase of induced injury in the adjacent examined kidney and ureter." Furthermore, there did not appear to be stenosis in any of the renal artery vessels in all levels. There was no evidence of luminal narrowing or any significant renal artery anatomical changes. All vessels appeared to be potent in all levels. In actual practice, the effect is lasting, for example, can last for over 1 day, over 1 month, or other smaller, intermediate or larger time frames. Figures 9A-9H are histological images from the treated animals showing the results. In practice, obtained results can be compared to the histological images and/or reports described herein, for example, to determine a lack of substantial damage, for example, as described herein. Figure 9 A is an image of a slide obtained at 14 days, for the animal treated with ultrasound parameters: frequency of 10 MHz, intensity of 25W/cm , and for 30 seconds. Figure 9B is a blown up image of figure 9A. Area of thermal damage at 5:00 to 7:00 with multiple fibrosed/necrosed nerves and small vessels with fibrinoid necrosis. XN(A) shows marked epineurial/perineurial fibrosis with almost complete obliteration of endoneurial tissue. XN(B) shows marked perineurial fibrosis with vacuolization of endoneurial tissue. Figure 9C shows images of a slide obtained at 14 days, for the animal treated with US parameters: 20 MHz, 30W/cm , 30 seconds. Note nerves with moderate to marked perineurial fibrosis and necrosis of endoneurial tissue in (B). Figure 9D shows images obtained at 30 days, for the animal treated with US parameters: 10 MHz, 30W/cm , 10 seconds. The top left image shows unremarkable surrounding soft tissue. The top left image shows perineural inflammation with focal disruption of perineurium. The bottom left image shows focal mild perineural inflammation, the soft tissue in between nerves is unremarkable. The bottom right image shows focal mild perineural inflammation with intact perineum. Figure 9E shows images obtained at 30 days, for the animal treated with US parameters: 10 MHz, 30W/cm , 30 seconds. The top right image shows the relation of the injury to the renal artery. The top left image shows minimal perineural inflammation. The bottom left image shows the relation of injury to the renal artery. The bottom right image shows effaced nerve fascicle with fibrosis. Figure 9F shows images obtained at 30 days, for the animal treated with US parameters: 20 MHz, 20W/cm , 10 seconds. The images on the left side show the relation of the injury to the renal artery. The top right image shows moderate perineural lymphohistiocytic inflammation. The bottom right image shows mild perineural lymphohistiocytic inflammation. Figure 9H shows images obtained at 90 days, for the animal treated with US parameters: 10 MHz, 30W/cm , 30 seconds. The images on the left side show the relation of the injury to the renal artery. The image on the top right shows epi/perineural chronic inflammation in two nerve fascicles with partial effacement. The image on the bottom right shows a nerve fascicle with degenerating cells with hyperchromatic (black arrow tip) nuclei and overall cellular depletion. NOTE: Histological slides prepared with hematoxylin and eosin (H&E) stain. Serum Creatinine: Serum Creatinine was used as a marker of kidney function. Serum Creatinine was measured prior to treatment and at 30 or 90 days after the procedure. There was no statistically significant difference between the two values. The result suggests that the renal denervation procedure not does cause clinically significant alternations in kidney function. Figure 8C is a graphical representation of the results. As illustrated by the decrease in NE levels, all 17 pigs were successfully treated by renal denervation using ultrasound energy, in accordance with some embodiments of the invention. The results provide support for the following relationships between selectable treatment parameters and obtainable reduced NE levels; Temporary treatment effects can be achieved, as NE levels fell from baseline to 14 and 30 days, but then increased from 30 days to 90 days. A relatively longer treatment time (e.g., 30 seconds vs 10 seconds) is used to obtain relatively lower NE levels by 30 days. A relatively lower frequency (e.g., 10 MHz vs. 20 MHz) is used to relatively lower NE levels. The results also illustrate that reductions in renal norepinephrine levels and corresponding reductions in nerve activity are obtainable without histologically visible long term significant damage to nerves and/or surrounding tissue. Furthermore, some embodiments as described herein have been shown to be safe, as no abnormalities occurred to the renal arteries during and immediately post treatment, as well as at 30 days and 90 days. applying energy to one or more renal nerves in an amount which is sufficient to reduce renal norepinephrine levels to said selected target level within about +/- 30%. 2. A method according to claim 1, wherein said predetermined target level comprises less than about 50% of a pre-treatment level or control baseline. 3. A method according to claim 1, wherein said predetermined target level comprises less than about 70% of a pre-treatment level or control baseline. 4. A method according to claim 1, wherein said predetermined target level comprises less than about 80% of a pre-treatment level or control baseline. 5. A method according to claim 1, wherein said predetermined target level comprises less than about 90% of a pre-treatment level or control baseline. 6. A method according to claim 1, wherein said predetermined target level comprises a predetermined target level at a predetermined time post-recovery. 7. A method according to claim 6, wherein said predetermined time post- recovery comprises about 30 days. 8. A method according to claim 6, wherein said predetermined time post recovery comprises about 90 days. 9. A method according to claim 1, wherein said energy comprises microwave energy. 10. A method according to claim 1, wherein said energy comprises a broad ultrasound beam ultrasound. 11. A method according to claim 10, wherein said applying comprises applying said broad ultrasound at a frequency ranging from about 1 MHz to about 40 MHz. 12. A method according to claim 10, wherein said applying comprises applying said broad ultrasound for a time of about 10 seconds to about 30 seconds. 13. A method according to claim 10, wherein said applying comprises applying said broad ultrasound at an intensity of about 10 watt/cm 2 to about 60 watt/cm 2. 14. A method according to claim 1, wherein said energy is applied intracorporeally from at least one of a renal artery and an aorta. 15. A method according to claim 1, wherein said applying comprises applying said energy in an amount which is insufficient to cause clinically significant damage to an intima and a media layer of a renal artery. 16. A method according to claim 1, wherein said applying comprises applying said energy in a manner which is not sufficient to cause significant thermal visible damage on histological examination to said renal nerves at 30 or more days post treatment. 17. A method according to claim 16, wherein said histologically visible damage comprises histologically visible damage with at least one of an H&E stain and a Movat stain. 18. A method according to claim 1, wherein said renal norepinephrine levels are measured by at least one of analysis of a kidney biopsy and norepinephrine spillover. applying broad ultrasound energy to one or more tissue regions in an amount which is sufficient to reduce activity of one or more renal nerves such that a clinically significant effect is obtained, thereby treating said patient. 20. A method according to claim 19, wherein said energy comprises intracorporeal non-focused ultrasound. 21. A method according to claim 19, wherein said applying comprises applying said energy in an amount which is insufficient to cause clinically significant narrowing of a renal artery. 22. A method according to claim 19, wherein said applying comprises applying said energy in a manner which is not sufficient to cause significant histologically visible damage to said renal nerves at 30 or more days post treatment. 23. A method according to claim 22, wherein said histologically visible damage comprises histologically visible damage with at least one of an H&E stain and a Movat stain. 24. A method according to claim 19, wherein a reduction of some of activity of efferent sympathetic renal nerves is temporary. 25. A method according to claim 19, wherein some of comprises at least 50% of efferent nerves. 26. A method according to claim 24, wherein said temporary comprises a return to at least 50% of a baseline activity. 27. A method according to claim 24, wherein said temporary comprises less than about 120 days. 28. A method according to claim 19, wherein said clinical disorder comprises at least one of hypertension, sleep apnea, obesity, diabetes, end stage renal disease, heart arrhythmia and/or congestive heart failure. 29. A method according to claim 19, wherein said applying comprises applying energy to one or more tissue regions around a circumference of a renal artery. 30. A method according to claim 19, wherein said applying comprises applying energy to one or more tissue regions not surrounding an artery. 31. A method according to claim 19, wherein said applying comprises applying energy to one or more longitudinal locations along a renal artery. 32. A method according to claim 19, wherein said applying comprises applying energy to about 0.1% - 5% of the artery wall by cross sectional area. 33. A method according to claim 19, wherein said applying comprises applying energy to one or more regions having an area of about 1 mm 2 - 20 mm 2 per said region. 34. A method according to claim 19, wherein said applying comprises applying energy to both renal arteries. 35. A method according to claim 19, wherein said applying comprises applying energy to an arterial stump. 36. A method according to claim 19, wherein said applying comprises applying energy to at least one of an adventitia and a periarterial region of a renal artery. selecting an intensity of said non-focused ultrasound energy; selecting a time of delivery of said non-focused ultrasound energy; and setting up said device to be suitable for delivering a predetermined amount of said non-focused ultrasound energy to one or more renal nerves according to said frequency, said intensity and said time. 38. A method according to claim 37, wherein said frequency of said non- focused ultrasound ranges from about 10 MHz to about 20 MHz. 39. A method according to claim 37, wherein said time comprises about 10 seconds to about 30 seconds. 40. A method according to claim 37, wherein said intensity comprises about 20 to about 30 watt/cmA2. applying energy to one or more renal nerves in an amount which is sufficient to temporarily reduce renal norepinephrine levels to a predetermined target level, wherein said temporarily comprises a return to a baseline of at least 50% of a baseline. 42. A method according to claim 41, wherein said energy comprises intracorporeal non-focused ultrasound. 43. A method according to claim 41, wherein said temporarily comprises less than 120 days. 44. A method of selectively reducing nerve function in an animal or human, said method comprising: applying energy to one or more nerves in an amount which is sufficient to selectively reduce nerve function, but said amount is not sufficient to cause significant chronic thermal visible damage on histological examination damage to said nerves. 45. A method according to claim 44, wherein said energy comprises intracorporeal non-focused ultrasound. 46. A method according to claim 44, wherein said histologically visible damage comprises histologically visible damage with at least one of an H&E stain and a Movat stain. 47. A method according to claim 44, wherein said nerves are unmyelinated nerves. 48. A method according to claim 44, wherein said nerves have an axonal diameter of less than about 500 micrometers. comparing said measured blood pressure to a baseline blood pressure rise; and verifying a selected reduction in said afferent renal nerve function according to said comparing. 50. A method according to claim 49, wherein said verifying is performed during the procedure to measure the effect. 51. A method according to claim 49, wherein said drug comprises at least one of adenosine and bradykinin. 52. A method according to claim 49, wherein said baseline blood pressure rise comprises a baseline blood pressure rise due to delivery of said drug to said kidney before treatment. 53. A method according to claim 49, further comprising repeating a treatment according to said verifying, to further reduce said function to a selected level. 54. A method according to claim 53, wherein said repeating comprises repeating during the same procedure. wherein the controller is configured to deliver enough power to heat said target tissue a desired thermal effect to reduce nerve function to a preselected level. 56. An apparatus for selectively reducing function of nerves comprising: an energy emitted with settings suitable to obtain a desired thermal effect to reduce nerve function to a preselected level. an interface adapted to obtain at least one of a treatment time and a treatment intensity from a user, said interface coupled to said energy emitter. a memory comprising predetermined settings to obtain a desired reduction in renal nerve function. 59. A catheter according to claim 58, wherein said catheter is marked with said desired reduction. 60. A catheter according to claim 58, wherein said catheter is adapted to couple to a controller, and said catheter is adapted to program said controller with said predetermined settings. 62. A method according to claim 61, wherein said lasting effect comprises over 1 day. 63. A method according to claim 61, wherein said lasting effect comprises over 1 month.